No Commission - Sell your house today and save! 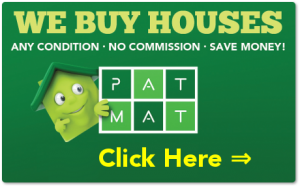 PatMat Property Solutions are the leading private house buyers in Auckland. We are a well established company with years of experience and a proud record of happy customers. Sell your house today and pay No Commission! Why give up thousands of dollars in agents commission and marketing fees when you can sell your house today and no commission. The price we offer is the price you get. No hidden fees, no marketing contributions, no false promises. Call us today for no obligation chat and see how much you can save by offering your property to us. We care about your situation and will offer a solution to suit your needs. Whether you are moving overseas, need to relief mortgage struggles, or you have a property that’s in a poor condition and needs urgent repairs let us know – we are private home buyers and offer competitive price for Auckland properties! Make sure you talk to us before signing up with an agent. It may be one of your smartest decisions! Even if you are not ready to sell yet and are only considering the options we would like to hear from you. Don’t be afraid to call us – it’s completely non-obligation. For anything property-related talk to us! We are here to help!